I got totally hooked on making my own granola during the fall when I made the MOST AMAZING chewy cinnamon raisin granola bars and then a short time later I made TRULY ADDICTING pumpkin seed granola. Where has homemade granola been all my life?! When I was brainstorming what I wanted to make for a Valentine’s Day post, I felt like trying for something on the healthy side. Or at least healthier than, say the Peanut Butter Cup and Oreo Layered Dessert that has been doing so well since the beginning of the month (you think people are trying to eat healthy for the New Year? According to my blog stats, they’re NOT). Anyway, back to the recipe brainstorming. 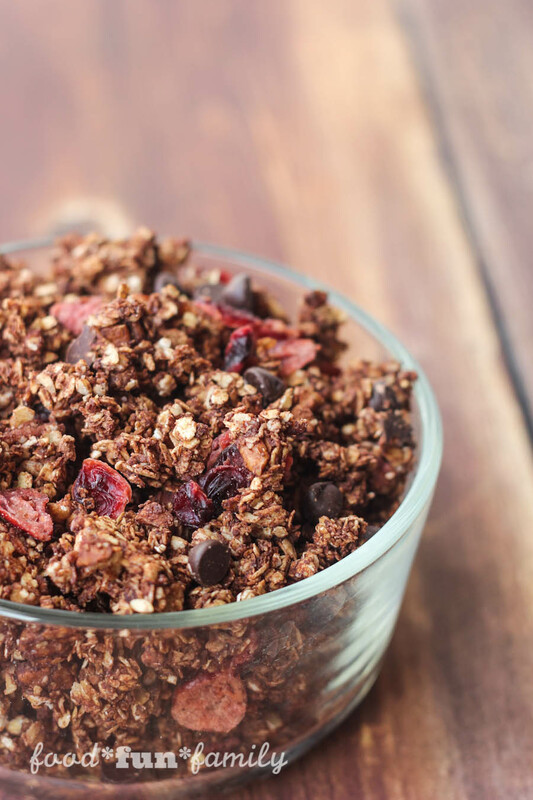 I wanted to make something that was a little healthier AND that had dark chocolate, and I thought I’d try making my basic granola recipe with cocoa and dark chocolate chips to see how it turned out. Let’s just say that I was totally blown away. First of all. Prepare for your house to smell like HEAVEN. And then get your taste buds ready. Wow. This is not too sweet, but it still feels totally indulgent. It certainly satisfies my chocolate cravings, but I’m happy because I’m actually getting some nutrients in with my chocolate fix (you know, as opposed to just popping a handful of dark chocolate chips straight in my mouth…). Bottom line: whether you make this for a special Valentine or for a just-for-you treat anytime, you need to make this. Mix oats, chopped pecans, brown sugar, cinnamon, cocoa powder, and salt in a medium bowl; stir to combine. In a small microwaveable bowl, heat honey and coconut oil on medium heat for 40-60 seconds. Stir in vanilla extract. Pour the hot honey mixture over the oat and nuts mixture, and stir so that the dry ingredients are evenly coated with the wet ingredients. Spread the granola mixture evenly onto a cookie sheet lined with parchment paper or a Silpat baking mat. Bake the oats at 350° for about 5 minutes; stir. Bake for another 5-7 minutes. 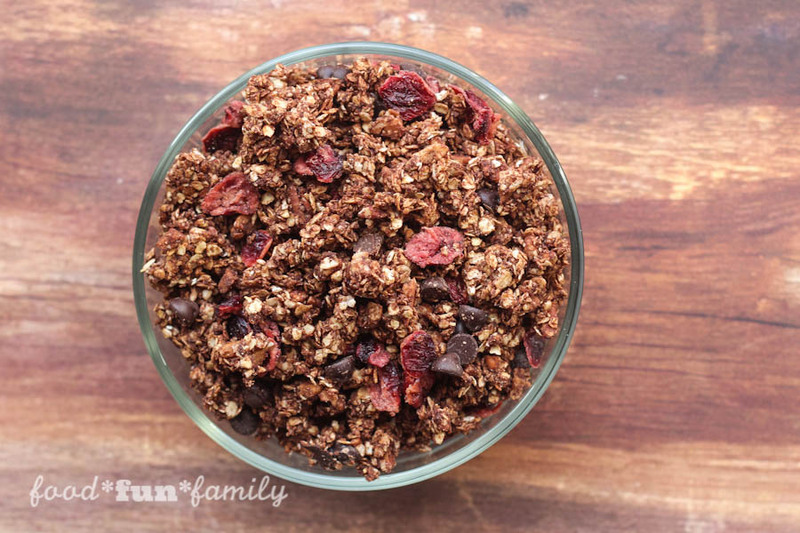 After granola has completely cooled, break it into pieces and stir in chocolate chips and cranberries. Store in an airtight container. Healthy & delicious – I can’t wait to try it! Thank you for linking up to this weeks Creative K Kids’ Tasty Tuesday – I can’t wait to see what you share with us next week! 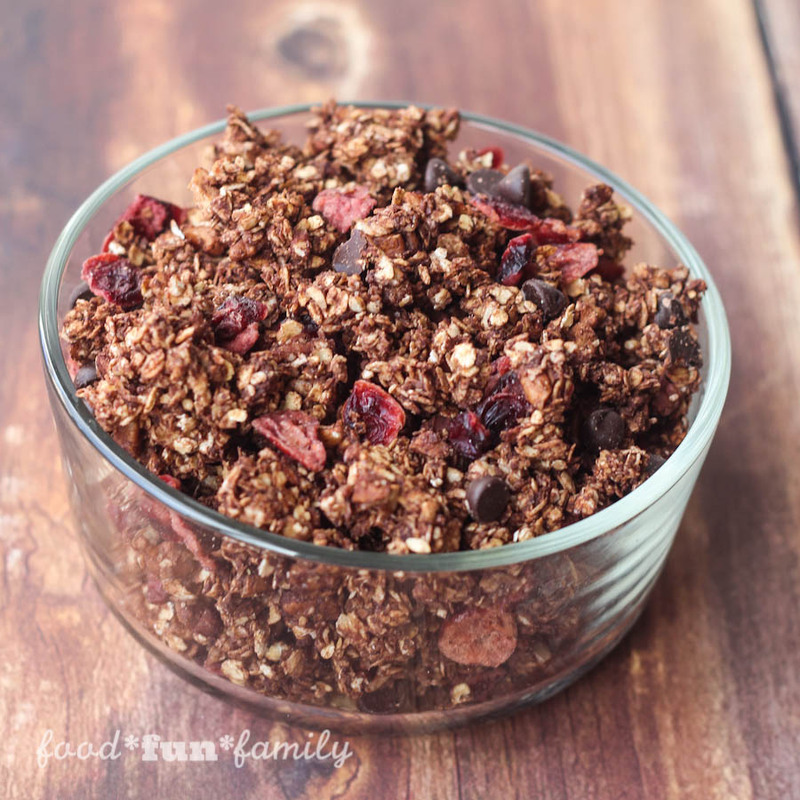 Your dark chocolate granola looks so delicious!! I want to make it and have for breakfast. It sure is easy to make. Thanks for sharing! What a tasty and gorgeous looking snack! On top of that, it’s healthy and convenient! Thanks for linking up at the delicious dishes recipe party. This looks so good I had to pin it! Would love for you to share this at Celebrate Your Story! Link Party. http://www.thesweetsensations.com/33-magic-housecleaning-tips-link-party/ Hope to see you there! Homemade granola is definitely a game changer, isn’t it? And I love some chocolate with my breakfast (not just on Valentine’s Day) and this looks like the perfect treat! Add some Greek yogurt and maybe a few blueberries? Heaven! Pinned! Mmmm, sounds good. Hard to go wrong with chocolate in a breakfast food! I love making homemade granola! I can’t wait to make this one. Pinned! 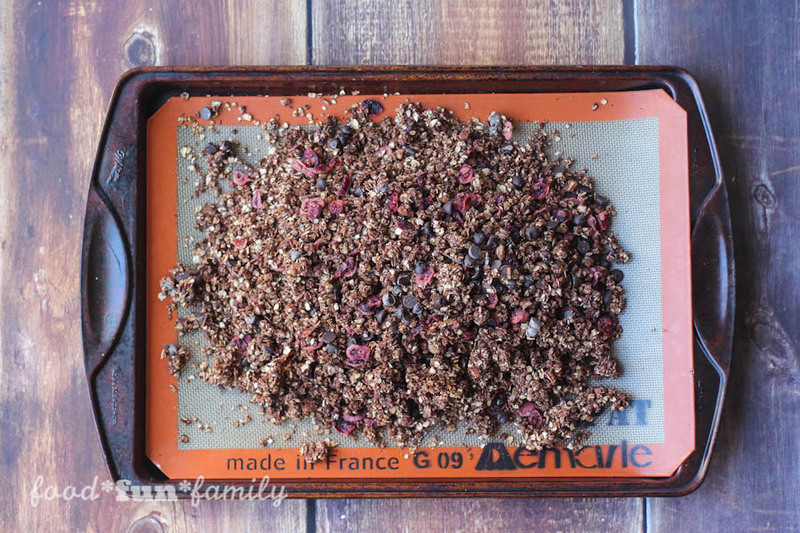 I’ve gotten totally hooked on making my own granola. Now I just need to figure out what flavor to do next…although I think chocolate will be a hard one to beat! I love granola! 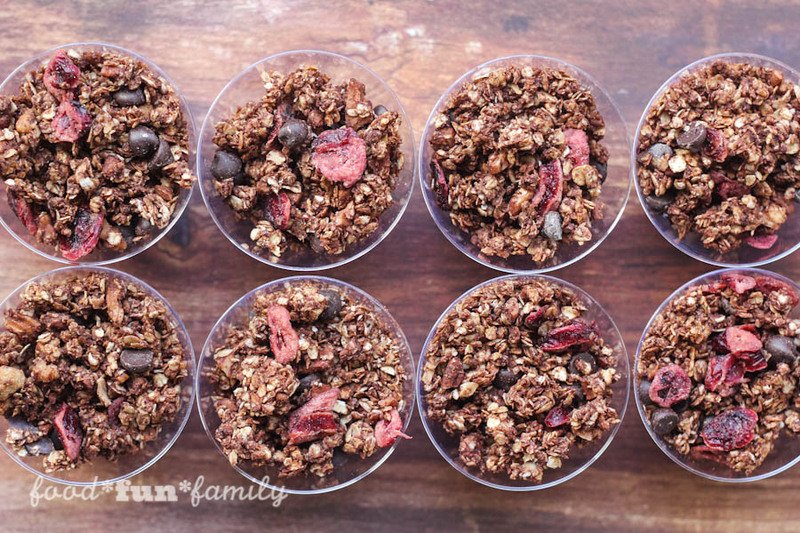 Chocolate granola sounds absolutely delicious! Yum!!! I’ve never made my own gronola before but I do love to eat it. I want to try to make this.